Salmon is a regular meal at our house, so we try different ways of presenting it. Most of the time though, it is simply baked as in this case. It’s the easiest. A great testament to the eponymous 30-minute meal by Rachael Ray. The only difference on this version is the garlic extravaganza. Sprinkle the side of salmon with the chopped garlic, salt and pepper. Dot with butter pieces, and squeeze the juice of one lemon all over. Bake at 400 degrees for 20 minutes and you’re in garlic nirvana. Again, if you have fresh herbs on hand, a sprinkling of basil or parsley would be a great addition to this dish. Enjoy over rice, or if you’re conserving carbs, just veggies. In this case, we had it with blanched baby bokchoy. A very heart healthy meal! (which I am told is what I should be having more of) bah! Can you believe I’ve never had salmon? This recipe makes me me really want to try it, I LOVE garlic! Ting, yes, we are definitely in a garlicky mode. Another garlic recipe coming up shortly. You know I never knew to use mayo with salmon until a friend introduced us to it not too long ago. She also said she marinades chicken and ribs in mayo before grilling. I’ll be trying that as soon as it starts warming up again. Hi Rowena! oh yeah, garlic rules! 🙂 I think I’ve eaten so much garlic, that it really does not smell unpleasant to me at all. I actually love to smell my daughter’s breat after she had a bowl of pasta and garlic 🙂 Hey, I’ll be looking out for that Rice Rhapsody movie too. I want to see Martin in any role. Just curious if he’s as funny as when he’s cooking. So what will be your next posting? I just posted my “Beef Enchiladas” blogging is really fun. We share same food with a different recipes. 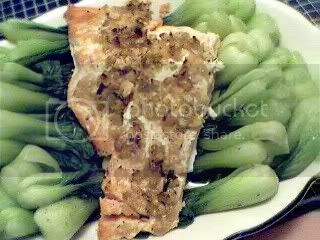 I’m a garlic fan so I love your “Garlicky Salmon Bake” and your bokchoy – looks good too! I LOVE garlic! I mean, forget about having bad breath/body odor afterwards, who cares? I love the smell of fresh garlic on my hands when I chop some to use for cooking! Happy New Year to you too! Thanks for that comment on Martin Yan… me too, I’ve tried chopping stuff like he does but eh, he’s simply a master at it and a joy to watch him at work. I want to check out his romance comedy. Should be cute to see him play a romance lead! In a garlicky mode huh JMom? I love salmon with lots of garlic and mayonnaise in it.